Published as part of the series PÁLFFY EDITIONS by SCHLEBRÜGGE.EDITOR. 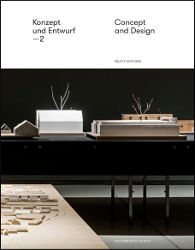 This is the second comprehensive publication by the Department of Design and Theory of Design, headed by András Pálffy, at the Institute of Architecture and Design at the Vienna University of Technology. It presents the results of student projects dedicated to a variety of subject matter. This time arranged according to seven geographic locations, ranging from Sardinia (Cala Domestica), Naples (Vico Giganti) and Friuli (Verzegnis) to Berlin (Reichpietschufer) and Glasgow (Center for Literature), the students' architectural designs subjected the buildings to a conceptual evolution and addressed potential areas of friction. This publication is lavishly illustrated with the students' sketches and model photographs as well as with historical images and diagrams. András Pálffy (b. 1954 Budapest) is Head of the Institute for Architecture and Design at the Vienna University of Technology. He studied there from 1974 to 1985 and was a teaching assistant at the Institute of Residential Architecture and Design from 1989 to 1992. He was a visiting professor at the University of Art and Design Linz from 2001 to 2002 and President of the Vienna Secession from 2007 to 2013.